Communication is not only an essential tool in our daily life, it is also an indispensable tool in project management. We communicate to share information, to share ideas, and to influence others. Successful projects stem from effective communication. Now and then, we observe communication breakdowns. When we send a message to another person, we can never take for granted that our receiver will interpret our message the same way as we intended it. One of the main responsibilities for a project manager is to make sure everyone gets the right message at the right time. Various influences and elements are at play when a sender communicate the context of a message to a receiver in a specific medium. We communicate to get a message across. Are you communicating to inform, to persuade, to inquire, to confirm, or to clarify? 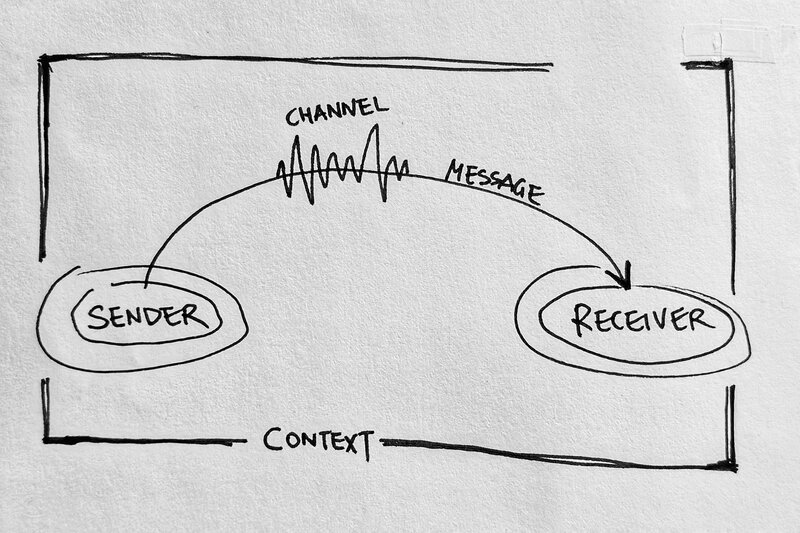 What do you want the receiver to do after your message is sent? Spend some time ahead to establish your purpose and intended outcome. Structure your message to directly contribute to your specific purpose and make that purpose clear to your receiver from the get go. One of the first mistakes I made was communicating identical information to everyone in the project team regardless of their role. A project manager is to act as a filter and deliver information that is tailored to each receiver. 1 – think about who needs what information. Not all information related to a project need to be communicated to everyone in the team. There is no advantage of supplying stakeholders or owners with information that is not needed or desired. It is a waste of time to create and deliver such information. 2 – use words from the receiver’s point of view. The receiver is more likely to accept messages they are familiar with. For example, use specific construction terminology with a general contractor when discussing details and use common vocabulary with a stakeholder to get the overall point across. Communication is a two way process, involving a sender and a receiver. Understanding the differences between yourself and the receiver is important in how the message is formulated. The receiver interprets the sender’s message through a set of filters based on their own value, beliefs, and background. Knowing your receiver can help determine when and how to deliver the message. Should your message be direct and to the point, or should it be more subtle and indirect? The intended meaning is often different than the perceived meaning. Project managers need to ensure clear and effective communication with both the stakeholders and the project team. Stakeholders directly influence the project scope and budget. The project team directly influence the project outcome. The project team is comprised of a large group of people working on different aspects of the project. Each member on the team should be clear about what he or she is responsible for achieving and what key progress to report. From time to time, the project manager synthesizes the inputs gathered and communicate the overall progress to the stakeholders. To communicate effectively, we also need to consider other factors such as the context communication is taking place in and nonverbal messages. Obtaining feedback is the best way to check for understanding and ensuring your message is accurately received. Take time to get to know your receiver and maintain open-mindedness when communication gets tough. Communication channel is the term given to the way in which we communicate. Our message can be delivered in many different ways, predominantly email, telephone, and face-to-face. Each communication channel has its own strength and limitations. E-mail is the most popular mode of communication used in project management. Not only is it more convenient to send out an email than picking up the phone, but it is also a great record keeping system. Emails are great for sending information that can not be communicated through the phone, such as drawing sets, specifications, and past records of communication. Some topics are best kept off of the records such as matters involving politics and conflicts. Emails are not designed for urgency, especially when the individual is receiving more emails than they can read. Sometimes it is best to get a hold of someone via phone or in person to communicate urgency and obtain an immediate response. Emails are not intended to be used as a group discussion. 50 person emails can become real messy real fast. Think about what other methods to use for communication before you resort to email in this situation. This is a mistake I made quite a few times at my first job. When you are communicating with dozens of people per day, it is likely you forget where you were in that particular conversation. Always skim through the previous emails to refresh yourself before responding. Before you send out a question, read the email thread. It might have already been answered. Also, do include the whole email thread when responding and looping in another individual to avoid confusion. Try your best to provide all necessary information in the first email. Otherwise, a simple email can turn into a conversation requesting for additional information. Take a few seconds to think about what other information the individual might need. For example if you are sending a conference call invite, it is a no brainer to provide the conference call number, access code, and some background information to provide some context. Telephone conversations are great for resolving urgent requests, building rapport, and problem solving. The tone of the voice can be heard via phone. Therefore, more feelings are communicated through. A voice tone that is monotone, distracted or lacking confidence sends a negative message. Over the phone, your voice communicates your emotional attitude toward the receiver. Therefore, speaking in an audible volume and in a friendly manner is important. Filler words and phrases such as “um”, “uh”, “like”, “sort of”, “you know”, “like I said” can jeopardize your credibility and clarity of your speech. Filler words are often an indication that you are thinking on the spot and have not properly prepared for the call. Listeners can hear confidence created through positive body language. Try smiling and sit up straight, the feeling of confidence and pleasantness will seep through. Face-to-face is still the most effective communication channel. We can determine the receiver’s body language, their tone and nuances in addition to what is verbally communicated. When problems cannot be resolve through email or phone discussions, a face-to-face meeting is usually the best method. Every communication has a purpose. Spend time to gather your thoughts, establish your purpose and the desired outcome. Keep your message concise and direct. Your receiver will appreciate your focus and clarify. Prepare relevant information to bring into the discussion and prepare to take notes during and after the discussion.